You can use the Wholesale Order window to make cross trades and flex trades on MEFF when connected to a MEFF Gateway Version 7.17.20 or higher. For entering cross trades on earlier gateway versions, refer to Cross Orders. In the Wholesale Order window, the following additional fields are used for submitting a MEFF cross trade. Open the product you wish to trade in a Market Grid window. 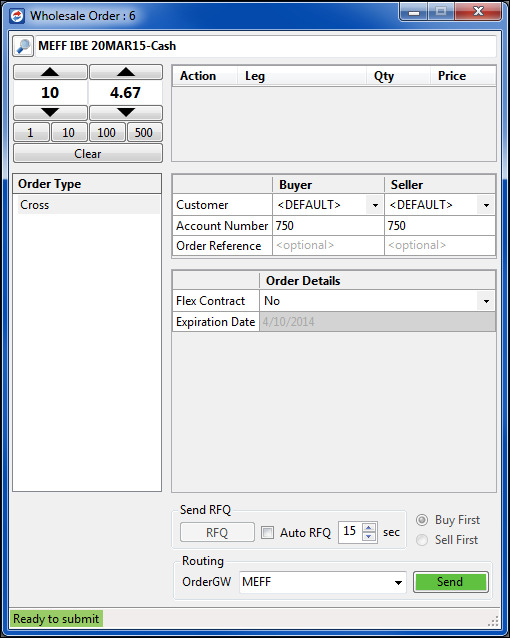 In the Market Grid, right-click the row containing the product and select Wholesale Orders from the context menu. Your administrator has not enabled wholesale trades in TT User Setup. The product/exchange does not support wholesale trades. Select Cross in the Order Types pane. The Contract, Quantity, and Price are populated automatically in the Wholesale Order window. A drop-down list of available Customers. Only customers selected in the X_TRADER Customer Defaults window appear in the Customer field list. This is an optional field. When a customer selection is made, the Account Number field is populated with the customer’s account number. Note: Any changes to customer defaults (e.g., select another customer) requires a relaunch of the Wholesale Order window to pick up the most recent changes. Sets the account name or number used for the trade. Populated from Account#. This is a required field for both buyer and seller. Sets whether the trade opens or closes a position. Enter optional text up to 15 characters. Once the fields are complete, press the Send button. A flexible contract or “flex trade” is a cross trade where the user overrides the original instrument value with a user-selected instrument value. For futures, you can override the expiration date; for options, you can override call/put, expiration, strike, and multiplier values. No RFQ timer is available for Flex Trades. In the Flex Contract field, select Yes from the drop down menu. Sets expiration date using the date populated in X_TRADER. Used for futures and options. 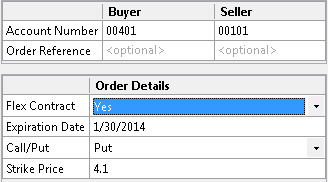 Select a call or put for an options contract. Sets the strike price for the selected options contract.